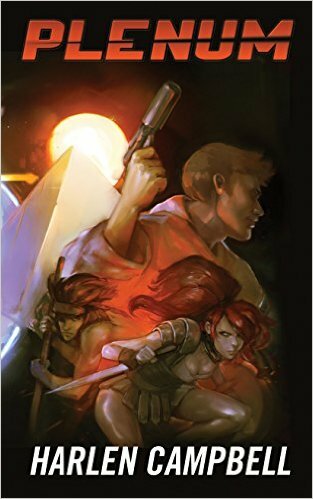 When I started writing PLENUM, I saw the book as a novelization of a lighthearted adventure story set in a time-traveling universe, a script I wrote back in the 90’s called The Game of Knights and Dragons. I wrote it for two reasons. The story grabbed me. It had an interesting hero, a challenging plot with lots of action, and a couple of terrific heroines, but the writing itself was a kind of test. I hadn’t written a book in years. Would the words still come for me? Would my characters dance? Would they bleed? Even more important, could I still find that sudden epiphany, the rush of excitement that comes when an insight into the characters or plot opened into an insight into my character or the shape of the world? This entry was posted in Book Notes and Reviews, Marketplace, My Life, Plot, Writing Life on June 30, 2015 by Harlen Campbell. I still believe that, but even back when I wrote it I knew I wasn’t being quite truthful. The motto implies that an author can write an entertaining story and then go back and somehow sprinkle it with themes and “personal concerns,” kind of like Tinkerbell sprinkled fairy dust over the Darling children to get them airborne. That never worked for me and I doubt it ever got another author’s stories aloft. In fact, one of the best ways to ruin a good story is by over thinking it. That doesn’t mean that a writer shouldn’t think about the story. As an aside, it might be possible to judge a writer, and a book, by the kind of thinking the writer puts into the work. The first level is thinking about plot: What can I do to these characters to make them do what I want? This can lead to a decent read, maybe even a best-seller, but it isn’t likely to result in a memorable story, and it is very unlikely to yield anything that resonates with the audience. To do that, we have to think about our characters. What drives them? What do they love? Hate? Fear? Worship? How far will they go to get what they’ve got to have? Perhaps most important: How much of our characters will our audience see in themselves? This is a deeper level of thinking about our work, and one indicator of success in it is how we answer the question: How much of ourselves are we prepared to reveal in our characters? If we will invest nothing of ourselves in our work, we may as well crack a bottle of decent bourbon and get on with the next car chase or sexual encounter, because we are just selling titillation. That’s nothing to be ashamed of. People need it to get through life, and it pays well if done well. But there is another level of thought that affects our work. We can think about the human condition: the world and our place in it. These are the personal concerns I warned myself about in that first paragraph. They are dangerous because they are compelling and we run a serious risk of surrendering to them. Our work can become didactic, preachy. Our characters can become subservient to our obsession or, worse, to an ideology, and if that happens we may as well chuck all our aspirations in the waste basket; we have become pamphleteers. My warning, however, was not to avoid wider thought. We need it to avoid drowning in the tsunami of vacuous cliche that daily spews over us from our politicians, religious leaders, and media pundits. The trick, I believe, is not to allow ourselves to believe that our truths, the small insights we gain so painfully by swimming against the flood, is the only, capital T, Truth. We can speak only our private truth, and if we want our books to matter to anyone, our best strategy is to con our characters into talking for us. This entry was posted in Character, Marketplace, Plot, Story, Writing Life on June 29, 2015 by Harlen Campbell.